SONY/RCA/Legacy Recordings Announce the Release of Monumental Definitive Edition of Elvis: That’s The Way It Is (Deluxe Edition), the King’s 1970 Album & Concert Documentary, Presented Together for the First Time Ever in a Deluxe Box Set (8CD/2DVD). That’s The Way It Is (Deluxe Edition) Includes Expanded Version of Original LP, Six Complete Shows from Elvis’ Electrifying Summer of ’70 Las Vegas Season, Rare and Insightful Rehearsals, the 1970 Theatrical Edit AND the 2001 Special Edition of “Elvis: That’s The Way It Is,” 80-Page Booklet featuring Rare Photographs, Memorabilia and Recording Data. In 1970, Elvis Presley fans were thrilled by the arrival of two cultural milestones: one an album, the other a full-length concert/documentary and each of them called Elvis: That’s The Way It Is. Since then, aficionados of Elvis have been clamoring for a package that included both the album and the film. On Tuesday, August 5, 2014, Legacy Recordings, the catalog division of Sony Music Entertainment, will release That’s The Way It Is (Deluxe Edition), the most ambitious Elvis Presley restoration package ever created, bringing together—for the first time ever–the album, the theatrical and home video versions of the film, six full-length concerts (featuring previously unreleased performances), rehearsal highlights and other rare recordings in one astounding and essential package. 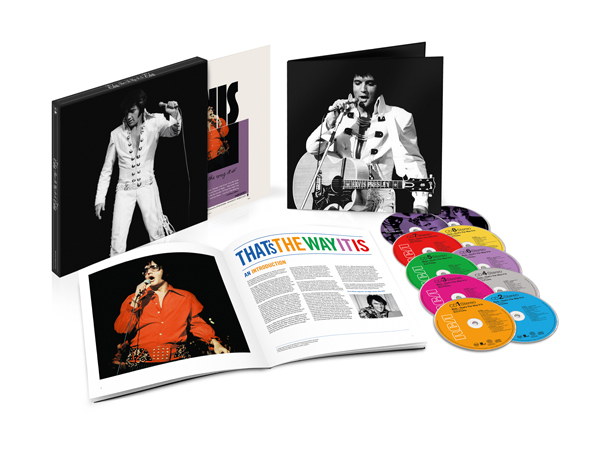 The result of an historic partnership between Sony Music and Warner Brothers Home Video, the deluxe set combines the video and audio assets of Elvis: That’s The Way It Is with unique and previously unreleased material. A highly-collectible 8CD/2DVD box set, That’s The Way It Is (Deluxe Edition), marks the first time the 1970 documentary and album have been available in a single package, with bonuses including unreleased material, remixed and remastered audio and a new 80-page book detailing the entire event with facts, songwriter and musician interviews, and photos in a deluxe 8CD/2DVD box set. A 2CD Legacy Edition of Elvis: That’s The Way It Is will also be available. Elvis: That’s The Way It Is (Deluxe Edition) is available for pre-order now on Amazon.com. Though never considered a soundtrack album, Elvis: That’s The Way It Is was initially released to accompany the first theatrical run of “Elvis: That’s The Way It Is,” a 1970 documentary feature, directed by Denis Sanders, which combined on-stage, off-stage and behind-the-scenes footage in Presley’s first non-dramatic film since his 1956 Hollywood movie debut. In the documentary, Sanders captured and illuminated a pivotal moment in Elvis’ transformation from teen idol to consummate showman, Memphis meets Vegas via Hollywood, the King’s return to full concert performances after years of film stardom. Early in 1970, Elvis returned to Vegas for a second engagement at the International, with RCA recording songs for the then forthcoming On Stage, February 1970. Elvis was on a roll and making big plans–including a feature film–surrounding what would be his third Las Vegas engagement, scheduled for the summer of 1970. On June 4, 1970, Elvis arrived at RCA’s Studio B in Nashville, where producer Felton Jarvis had assembled a hot new session band featuring Elvis’ on-stage guitar legend James Burton. Five nights of recording generated material for no less than three future albums and four singles, including Elvis: That’s The Way It Is and the essential Elvis Country album. On July 14, rehearsals for the movie and live shows commenced at the MGM lot in Culver City, California. The Hollywood cameras rolled for five different rehearsals prior to the opening night on August 10, including augmentation run-throughs with the singers and the orchestra at the hotel. Unquestionably, Elvis was keen to broaden his repertoire for the film, as more than 60 songs were attempted during the period, far more than the usual average of 20 to 25 that would normally be chosen. Over the four nights filmed by MGM, Elvis and his band worked tirelessly, trying out a broad variety of musical styles, emphasizing his desire to share the wide range of music he loved with his audience. Director Denis Sanders captured the end result magnificently, providing fans throughout the world with their first glimpse of the new contemporary Elvis performing at the peak of his vocal prowess both in rehearsal and on the stage. That’s The Way It Is (Deluxe Edition) centers on the six complete shows recorded and partially filmed by MGM. Two of the shows are released for the first time in their entirety; two more have only been available only through the mail-order Elvis fan-club network. The original RCA album is expanded with the four single sides from the period, and a selection of “fly-on-the-wall” outtakes from the June Nashville sessions that produced the majority of tracks for the album. Completing the audio section, a separate disc of insightful rehearsal highlights, featuring unusual song selections showcases both the hard work and the playful atmosphere that governed Elvis’ relationship with his musicians.